Farleigh is probably the heaviest-cropping of all the damsons. The abundant fruit has the characteristic rich damson flavour when cooked. Please fill in the details below and we will let you know when Farleigh damson trees are back in stock. 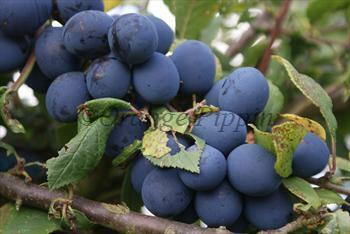 The definitive English damson, Shropshire Prune has the rich astringent flavour typical of damsons. Farleigh is in flowering group 3. Farleigh is partially self-fertile, but fruiting will be improved if there is a compatible tree of a different variety nearby. Since it flowers in the middle of the blossom season it can be pollinated by most other damson trees. Farleigh is one of the hardiest of damsons, making it a good choice for difficult situations where other fruit trees may not flourish. Discovered in Kent in the early 19th century.